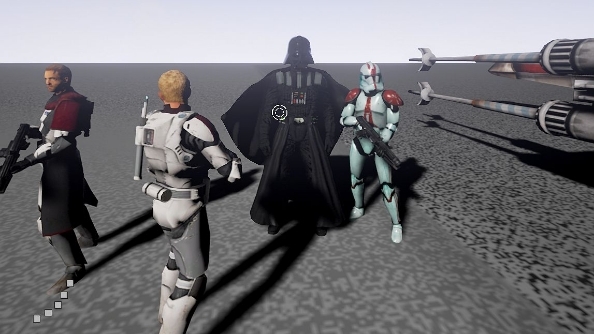 Reddit has spotted a brand new Star Wars fan project that aims to resurrect and recreate the lost Free Radical game Battlefront 3. If you prefer you Star Wars crafted by the triple-A men, try one of the best Star Wars games on PC. The third in the series of original Battlefront games was very close to completion when it was eventually canned, and the DICE version of Battlefront eventually proved to be a very different direction of the franchise. Naturally some long-term fans were unhappy, and a few of them have taken it as their mission to recreate the Free Radical version themselves. Galaxies in Turmoil, once known as Project Rebuild BF3, is being built in Unreal Engine 4 project by the Russia-based Frontwire Studios. When completed it’ll be available for free, with the intention of adding more to the game over time with DLC. Hoth and Tatooine are intended battlegrounds, with space-to-ground test maps to enable the epic battles that were scrapped for DICE’s version. DC-15S Blaster Rifle, Republic Grenade Launcher, Republic Missile Launcher, Z6 Rotary Blaster Cannon, and a A280C Blaster Rifle will all be available in the armoury. The project started earlier this month, so is very much in its infancy. There are obvious risks involved too; Star Wars is a huge deal for Disney, and they may not take kindly to an unlicensed group handling the IP. Indeed there’s a chance they’ve already taken action, as the project’s ModDB page is currently down.